Joe Green was born on October 25, 1932, in Eden, Texas. He enlisted in the Aviation Cadet Program of the U.S. Air Force for Basic Observer/Navigator Training on January 29, 1954, and was commissioned a 2d Lt and awarded his pilot wings at Harlingen AFB, Texas, on March 22, 1955. Lt Green next served as a WB-50 Superfortress navigator with the 55th Weather Reconnaissance Squadron at McClellan AFB, California, from April 1955 to June 1958, and then attended pilot training, receiving his pilot wings at Webb AFB, Texas, in July 1959. Capt Green then completed Helicopter Pilot Training at Stead AFB, Nevada, in December 1959, followed by service as a helicopter pilot with the 49th Tactical Fighter Wing at Spangdahlem AB and Ramstein AB, West Germany, from December 1959 to September 1961. His next assignment was as an SH-19 pilot with the 67th Air Rescue Squadron at Ramstein AB from October 1961 to January 1963, and then as Commander of Detachment 4, Atlantic Air Rescue Center at Ramstein AB from January to July 1963. 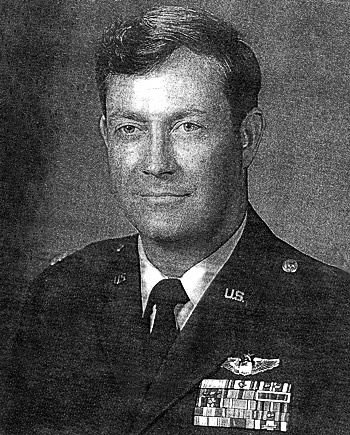 Capt Green served as an HH-43B pilot with Detachment 30, Central Air Rescue Center at Cannon AFB, New Mexico, from July 1963 to January 1964, and then with Detachment 2, Western Air Rescue Center at Cannon from February 1964 to August 1966. Maj Green next attended Air Command & Staff College at Maxwell AFB, Alabama, from August 1966 to August 1967, and then completed HH-3 Jolly Green Giant Combat Crew Training before serving as an HH-3 pilot with the 37th Aerospace Rescue and Recovery Squadron at Da Nang AB, South Vietnam, from November 1967 to November 1968. His next assignment was as the HH-3E Standardization Officer with the 3rd Aerospace Rescue and Recovery Group at Tan Son Nhut AB, South Vietnam, from November 1968 to June 1969, followed by service as a Research and Development Officer with Headquarters Aerospace Rescue and Recovery Service at Scott AFB, Illinois, from July 1969 to August 1971. Col Green attended Army War College at Carlisle Barracks, Pennsylvania, from August 1971 to July 1972, and then attended Language School at the Presidio of Monterey, California, from July 1972 to May 1973. His next assignment was as Chief of the Air Force Section with the U.S. Military Group in Managua, Nicaragua, from May 1973 to April 1974, and then as Chief of the Air Force Section with the U.S. Military Group in La Paz, Bolivia, from April 1974 until his retirement from the Air Force on August 1, 1975. The President of the United States of America, authorized by Title 10, Section 8742, United States Code, awards the Air Force Cross to Major Joe B. Green for extraordinary heroism in military operations against an opposing armed force as an HH-3E Rescue Crew Commander near the A Shau Valley, Republic of Vietnam, on 30 March 1968. On that date, Major Green led a force of four rescue helicopters over hostile territory in low overcast weather to reach the survivors from four downed United States helicopters. Intelligence briefings had disclosed that it was impossible to neutralize the hostile gun emplacements at the rescue site. Despite the knowledge that two additional helicopters were shot down while he was approaching the area, Major Green elected to make the initial rescue attempt. He persisted in the rescue attempt after hostile fire forced him away from the site. He made two additional approaches, courageously maintaining the aircraft in a stationary hover until the four most severely wounded survivors were rescued. Only then did fuel shortage, aircraft malfunctions, and the critical nature of the survivors' wounds compel him to leave the area. Through his extraordinary heroism, superb airmanship, and aggressiveness, Major Green reflected the highest credit upon himself and the United States Air Force.